The PHE & WS the nodal department for implementation of Swachh Bharat Mission (Gramin) in the State conducted a Review meeting on 1st August’2017 at Itanagar after completion of yearlong exercise to identify the status of Dysfunctional, Insanitary & Additional Toilets for households that emerged after 2012 Base line Survey (BLS) on the basis of which the Project Implementation Plan (PIP) was sanctioned. After a threadbare discussion and on the directives of Ministry of Drinking Water & Sanitation, Govt. of India the Govt. of Arunachal Pradesh took a bold step to make Arunachal Open Defecation Free (ODF) by 31st December of the calendar year 21 (Twenty One) months ahead of the national target for ODF by 2nd Oct 2019. Bamang Felix, Hon’ble Minster, PHE & WS urged the departmental officials to achieve open defecation status for entire Arunachal Pradesh on or before 31st December 2017 and further declared not to entertain any excuses in this regard. He further emphasized all the field officers to come up with concrete action plan and to inculcate team spirit, he announced for a State level competition to evolve a suitable toilet technology using indigenous locally available material for an appropriate alternative to septic tank, twin pit technology within the cost ceiling to do away with the cost and other disadvantage of the present technology which has not been found to be viable in the remote inaccessible areas. The Hon’ble Minister further announced incentives for the district achieving ODF in the first phase by way of considering execution of Defunct, Insanitary Toilets. In his strongest terms he further reiterated the mantra of the Govt. for officials “to perform or perish”. Superintending Engineers & the Divisional Officers presented the roadmap and strategies for achieving ODF status of Districts and the up-to date physical and financial achievements. H.K. Shalla, IAS Commissioner PHE & WS Department reiterated on timely accomplishment of target set for achieving ODF of the State by 31st December’ 2017 as per Project Implementation Plan (PIP) and clarified issues related to Direct Benefit Transfer (DBT). The Zila Swachh Bharat Preraks (ZSBP) appointed by Ministry of Drinking Water & Sanitation, Govt. of India and supported by TATA Trusts working in the various districts of the State shared their experiences and ideas towards achieving the objectives of Swachh Bharat Mission (Gramin). Mr. Rajat from the TATA Trusts also participated with his deliberations. 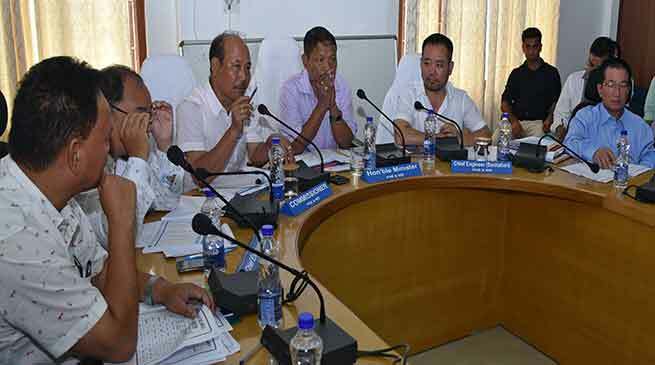 Amongst others the review was attended by Tomo Basar, Chief Engineer (E/Z), Sentum Yomcha, Chief Engineer (PHED), Joy Angu, SSW (Sanitation), PHE & WS Department, Itanagar.